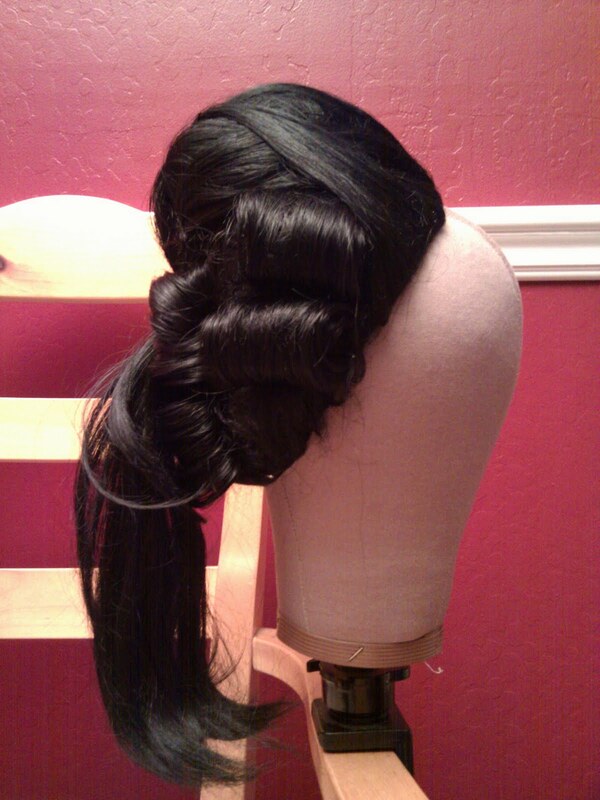 I spent a few hours yesterday styling this half-wig. I don't really know how to work hair, and this is NOT what I set out to make. I'm starting to hate doing hair. I'm afraid it'll all fall apart if I try it on. Argh. Ok, whiney rant over. 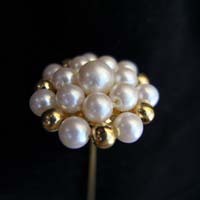 My goal was to make something smaller than what I wore at Evening at Le Petit Trianon. Yes, I've been so busy that I forgot to do a segment on that wig. My friend Gailynne constructed it, and it's awesome both in appearance and scale! I'll chat it up when I get back from Costume College. 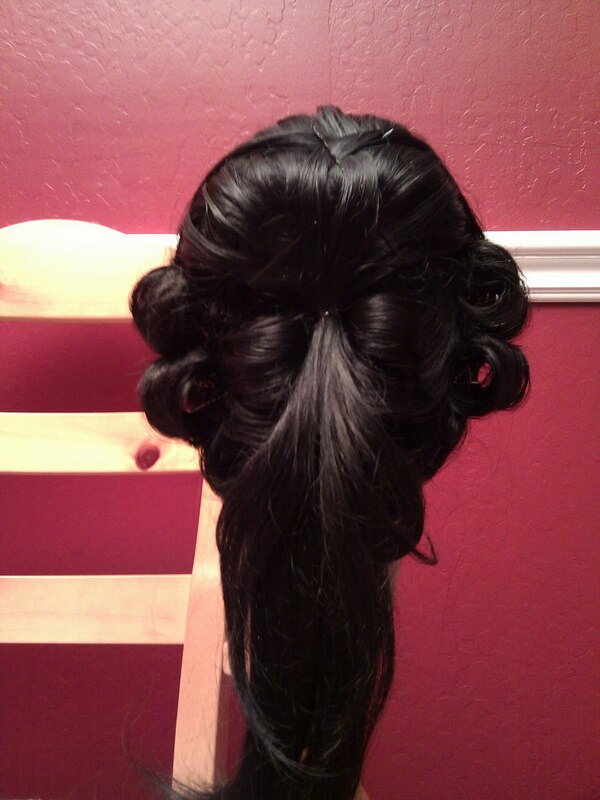 This is a half-wig, so it sits behind the hairline, and that hump will be on my head about where it is on the block. I read up on styling in Vintage Hairstyling by Lauren Rennells (specifically, how to create a '60s beehive and '40s "victory rolls"). Bleh. This wig looks like DUDE hair. Seriously. Rant over. Yes, I KNOW the lowest layer should be a shift...I don't have one...it's on the list...I'll get to it eventually!!! 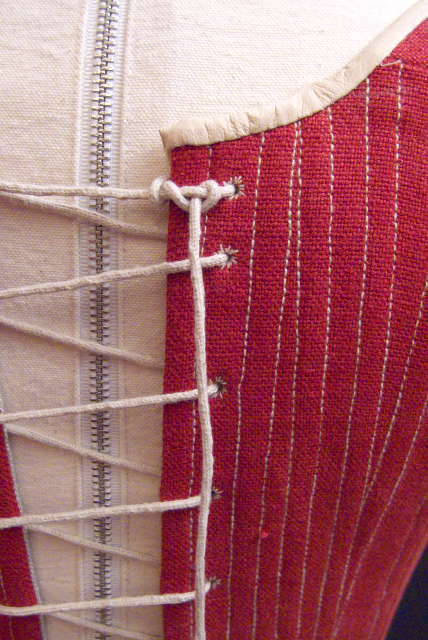 Front laced stays are not common, but not unheard of. 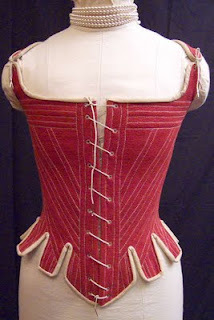 My old stays lace in back only, and are fully boned, so this was an attempt to do something completely different. Front lacing really does make putting this on super easy. 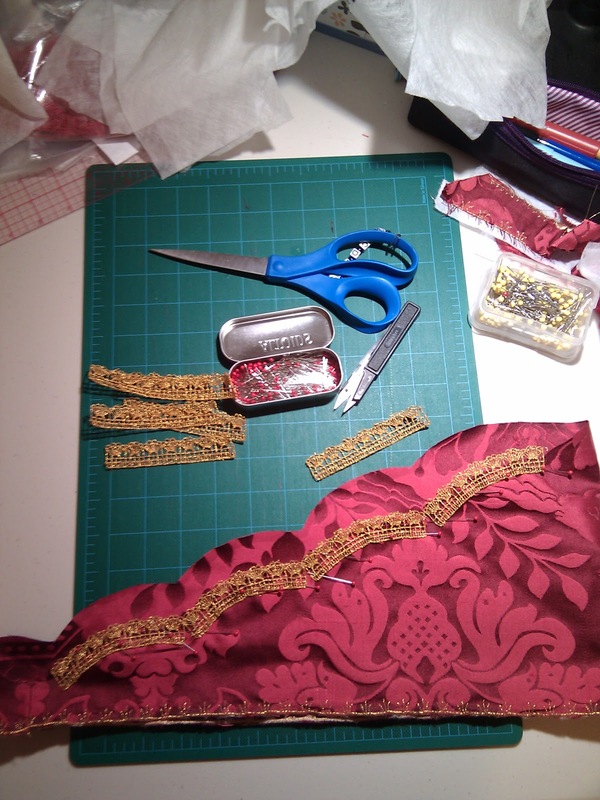 I started with the Butterick pattern, 4254, because the shape of the pieces are, essentially, documentable. I suspect this pattern is based on an illustration in Norah Waugh's Corsets & Crinolines but I don't have the book handy, and can't check. 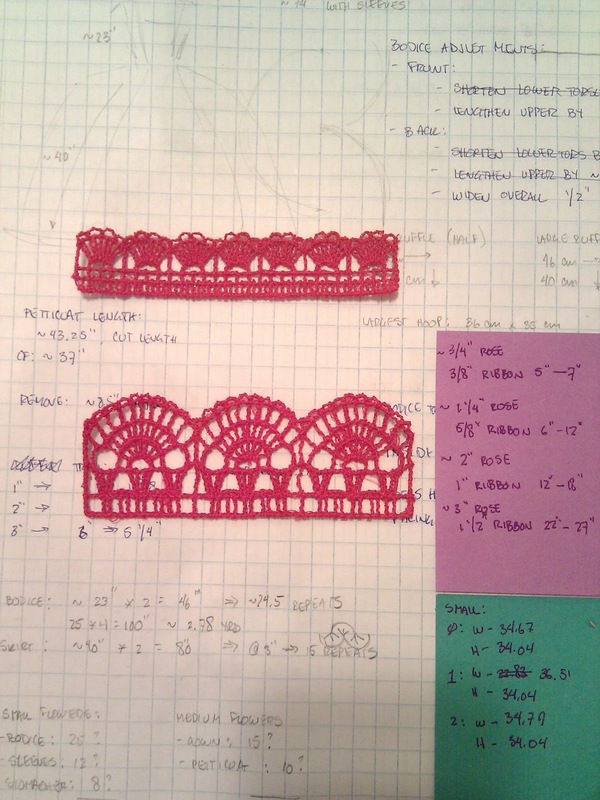 Aside from the the approximate correct shape of the pattern pieces, the pattern was BAD. 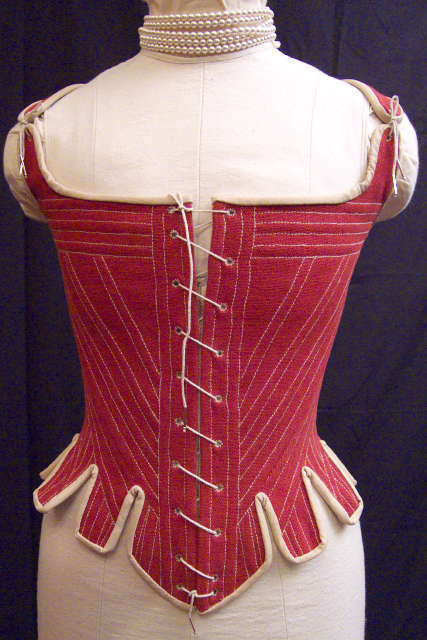 It had the typical "Big 3" problem, in that for my measurements it expects to be worn with back edges touching. The bigger problem, though, was that it's extremely short. My body runs a tiny bit short from bust to waist to hip, and it was waaay to short for me. I started with one size smaller than the pattern recommended, added length, removed tabs, moved the shoulder tabs...it's not really the same pattern anymore. I went through three mockups (and one expert fitting consultation) before I was satisfied. It's made of two layers of linen canvas, heavily starched, and one layer of what I think is an upholstery linen (it's quite thick ).To get the look of hand-stitched channels, I used a heavy linen thread on the exterior (35/2 from Burnley and Trowbridge), lighter cotton thread for the bobbin. 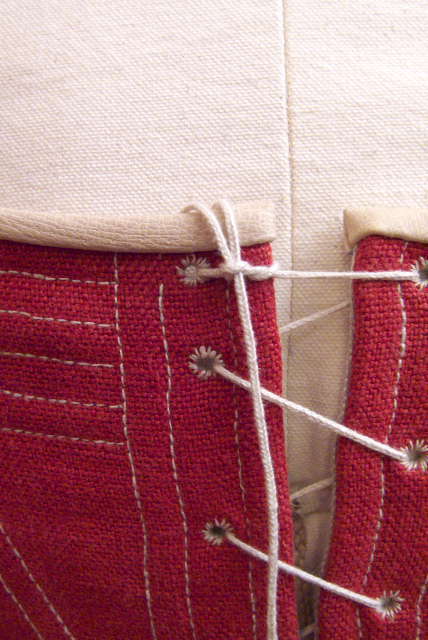 I used the same heavy linen thread for the eyelets.The boning is "artificial whalebone" (aka German Plastic). The binding is natural pigskin. Since I'm teaching a class on lucet weaving at Costume College this year, I felt I had to put rubber to the road, so the speak. So, the straps and front of the stays are laced with standard lucet cord, made from cotton crochet cord, and the back is laced with double lucet cord. 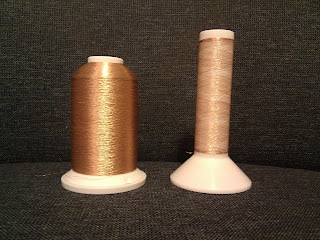 I think the cord is certainly sturdy enough for this application...I just need to get all the stretch out. I feel like I've been making these stays for 10 years...that's when I bought the tomato red linen that makes up the exterior. 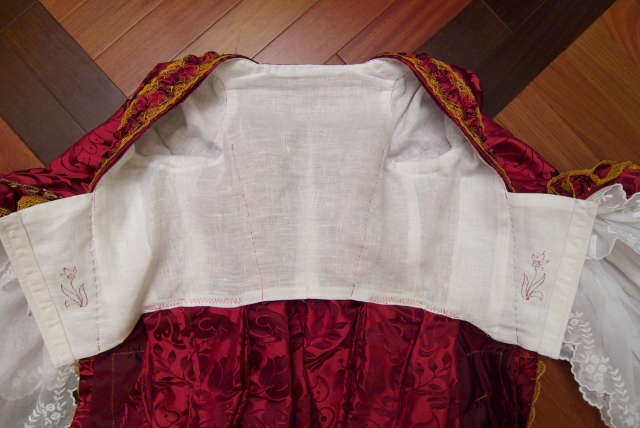 They have, of course, evolved in those years (for instance, I had originally planned to hand stitch the whole thing, and Butterick 4254 didn't even exist back then) and despite making the first mock-up two years ago, it took me until March of this year to actually CUT the red linen. Costumer's sewing block? Nah, I've just had so many other things to do, and have a great set of stays already...but the old stays has issues...hence, new stays! Egads, I have a lot going on in the next two weeks! 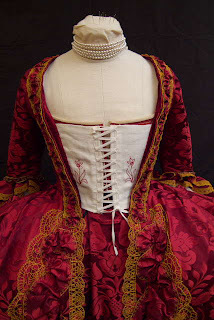 But I have two more posts related to the 1750 Court Gown, so I'll get them out lickity-split. For a pattern I used the illustration in Jean Hunnisett's Period Costume for Stage & Screen: Patterns for Women's Dress 1500-1800. I did shorten it, since apparently I'm not as tall as the typical stage actress. 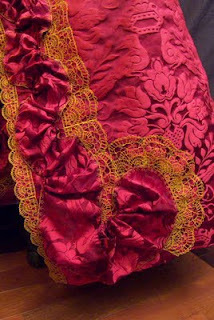 The fabric is silk taffeta, flat-lined it with a heavy weight silk organza. The hoops are modern hoopsteel; I would have like to use a natural, period material (such as basket cane) but that was proving to be too much of a pain, so I gave up. Control ties and hoop channels. 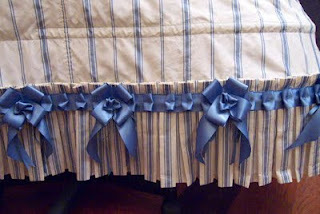 The hoop channels, waistband, ties, and trims around the ruffle are all polyester ribbon, either grosgrain or double-faced satin, in the same shade of blue. 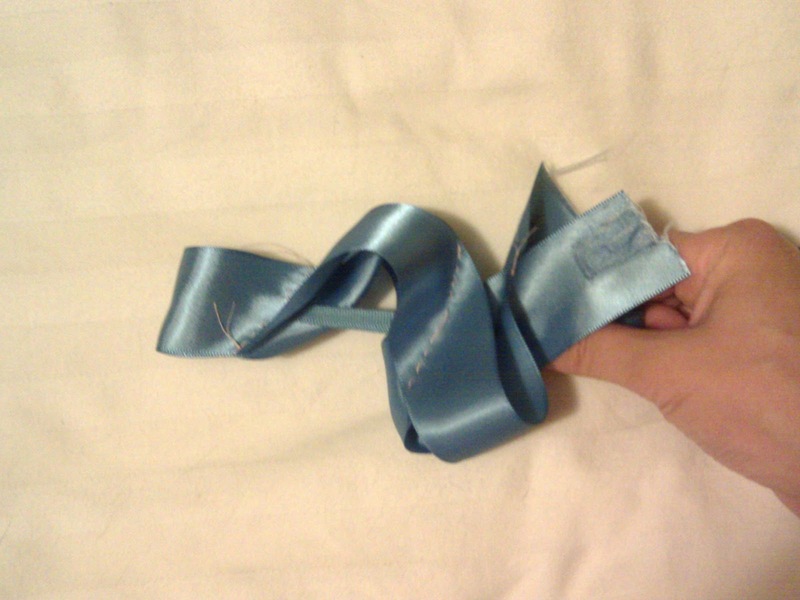 I tried to find a silk ribbon that matched the blue stripe in the fabric, but this poly ribbon was the best match I could find. C'est la vie. 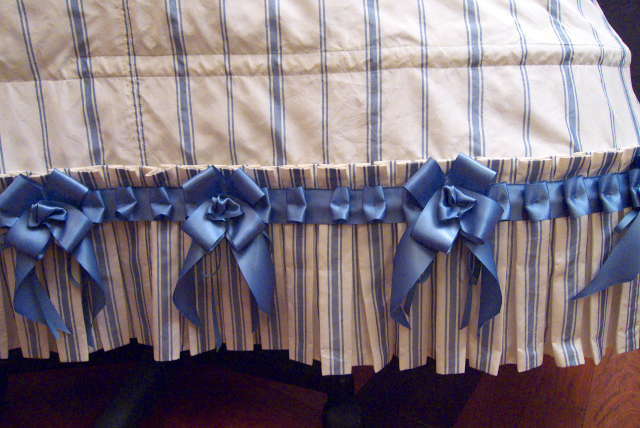 The bows along the ruffle are "butterfly pull bows." 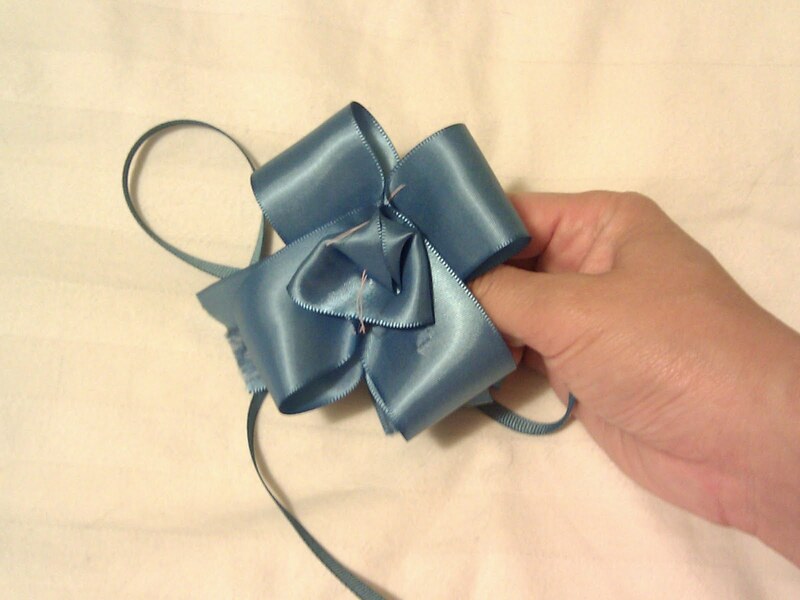 When I was a kid, I had some pull bows for gift wrapping. 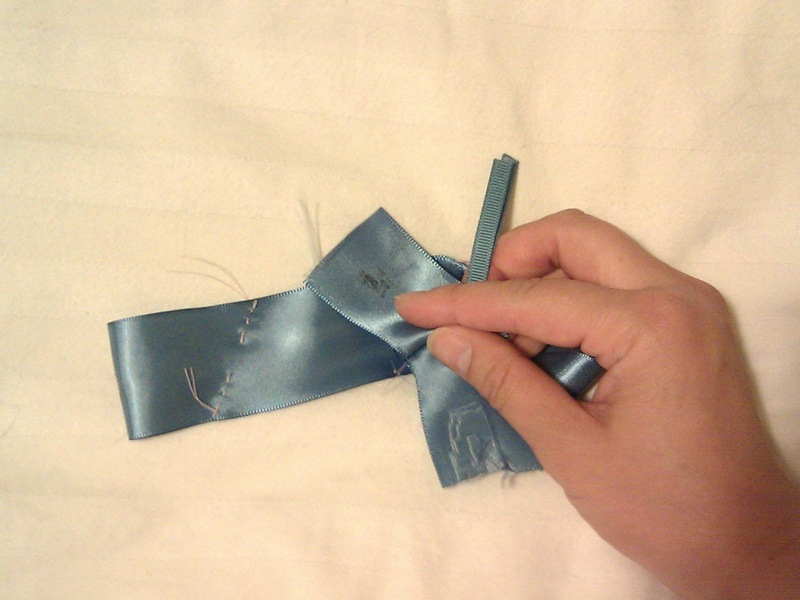 A little of 'net surfing (first to figure out what the heck these bows were called), and I reverse engineered how to make them. I made mine with just four loops; commercial gift wrap bows have eight to twelve. The bows come off, too. 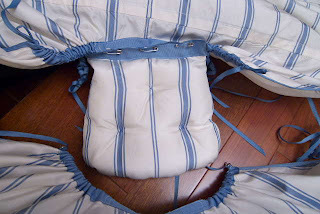 I just used the pull ties to tie them onto loops stitched onto the pannier. This is my tester, so it's sloppy. Inside are two pull ties. Pull the ties and gather up the main ribbon. And we have a bow! 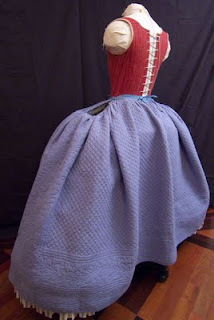 I made the pannier to be tied on, but it's really difficult to tie it on tight enough on my dress form (it would be a little easier on the body, because I can sit down and thus alleviate the weight). So, on each side, I tied a loop in the back tie and tied a heavy hook onto the front tie. Problem solved! It' much easier to put on that way. Hunnisett suggests putting a pad in the back, so I gave it a shot. 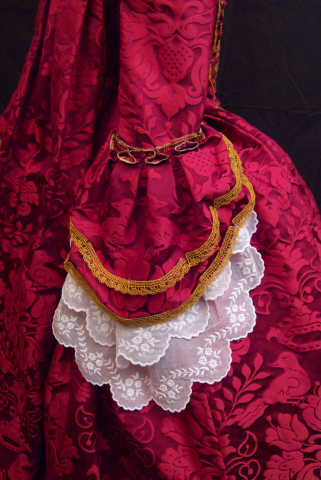 The effect is to tilt the pannier back, and I liked it, because it made the front of the pannier flatter. It's made from a single king-sized quilt, and yes, it's a little short but it does it's job (hiding the ridges made by the pannier's hoops) so I can't be bothered. 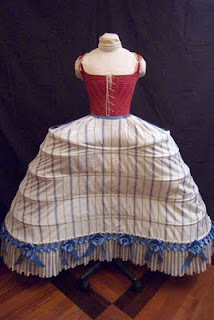 Period quilted petticoats don't have batting from hem to waist; the batting normally ends a few inches below the waist. I find this quite logical, because it makes the waist less chunky, and easier to pleat into the waistband. 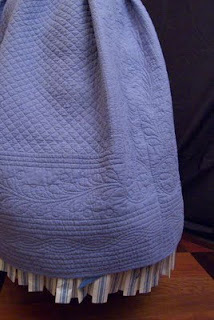 So, I pulled the quilting stitches out of the top of each panel, removed the batting, then re-quilted the area. Yeah, seriously tedious. 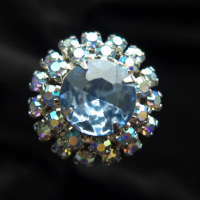 But I'm very pleased with the result. I also removed the batting from the seam allowance at the side seam, before doing a modified fell seam. 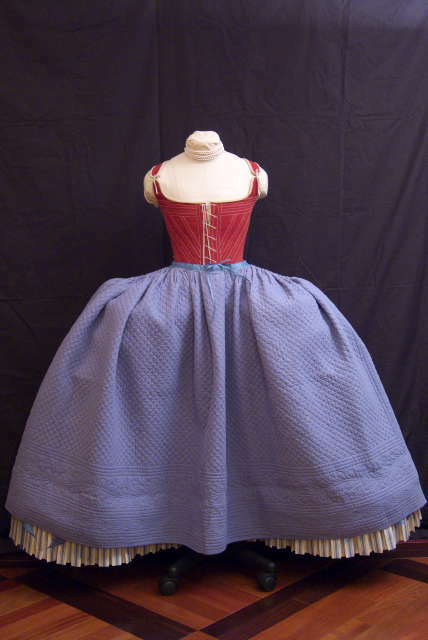 The quilted petticoat is easily the heaviest part of the whole garment, heavier than the pannier. 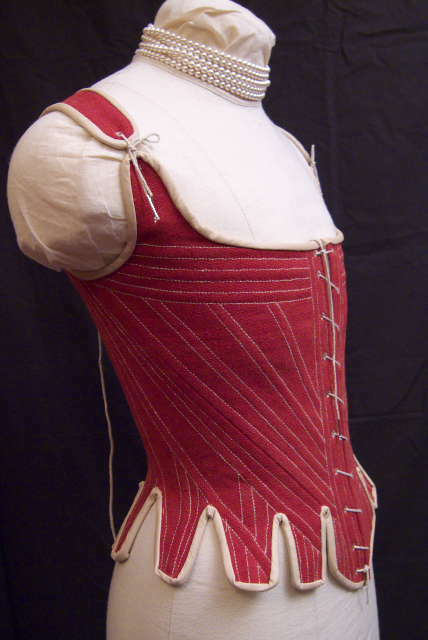 But it does give the gown an excellent shape and look, and, really, well fitted stays help to carry the weight. In this post I'll take the gown off the dress form and show how it's put together. As before, you can find high res photos, and many more of them, at my website. I used J.P. Ryan's pattern, and modified most of it. This wasn't because of any problem with the pattern, in fact, far from it. Patterns are drafted to fit someone, and because of my physical attributes, that someone isn't me. 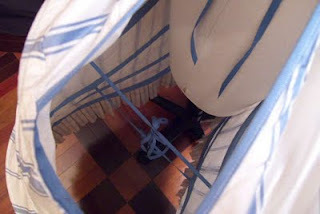 Moreover, I needed to change the back to work with the pattern in the fabric (I simply had to have symmetry) and the pattern was meant to go over J.P.'s pocket hoops, not a big pannier. 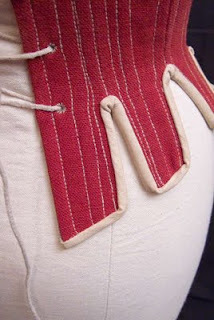 I do love J.P.'s patterns: they're well researched and meticulously drafted, and I've used them to make now five garments with super-happy-happy results. 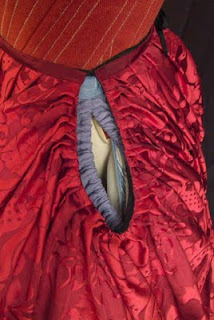 First, the stomacher comes off. 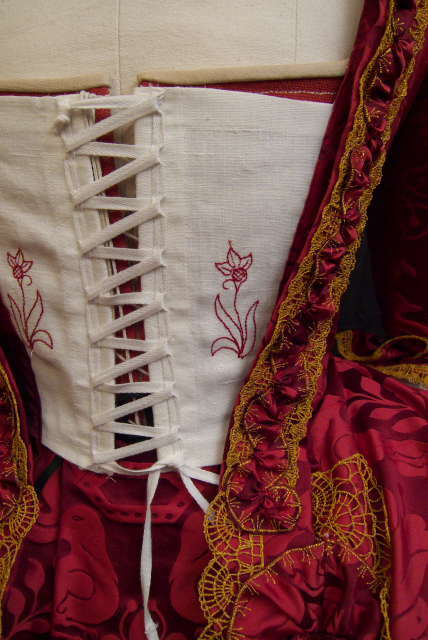 Underneath the stomacher is an under stomacher, which is what keeps the bodice on the body. 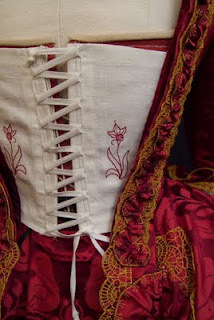 This is part of J.P.'s pattern and I think it's great, because it makes the bodice very stable. Here also you can see pattern cheat #1: instead of stitching eyelets to lace it shut, I used securely attached strips of cotton tape. 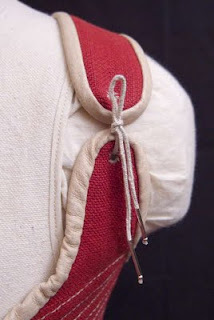 I learned this method from Jennifer at Festive Attyre years ago (and, indeed, used it on my facsimile of her Italian working class dress; you'll find her explanation on this page). 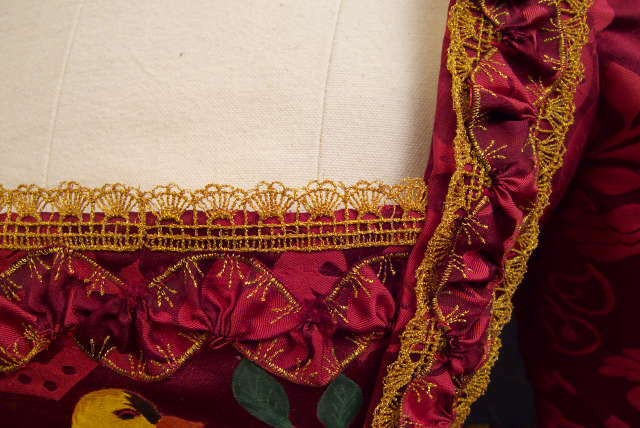 And because I can't leave well enough alone, I decorated the blank space on the under stomacher with a fancy machine stitch (technically, not embroidery since it doesn't require my machine's embroidery arm). 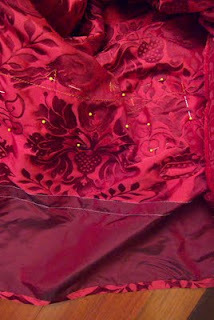 And to make my life easier, I attached a tapestry needled to the lacing tape. I wanted to try something different, so I cut out a section of the fabric featuring the birds, since I wanted to emphasize the "love birds" theme in the fabric. I painted just enough to fill the stomacher, using Neopaque silk paints from Dharma Trading. It was mostly like doing "paint by numbers", followed by some shading to give everything some dimension. I had some coverage problems with the yellow and orange, but all the other paints went on smashingly. I don't know the last time that I actually painted something (except for doll faces, which are quite different) so wasn't sure how this was going to come out, but in the end I can't complain (well, maybe a little, but I'll keep it to myself). The coloring of the birds are based on the yellow finch. 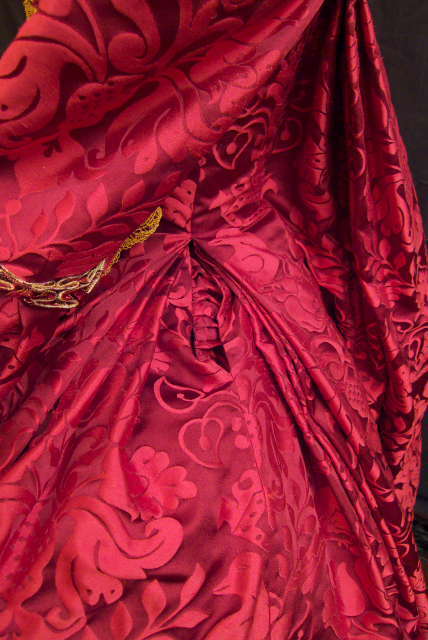 Painted silk is historically accurate (Hallie at Sign of the Golden Scissors has been talking about it, for instance, here). 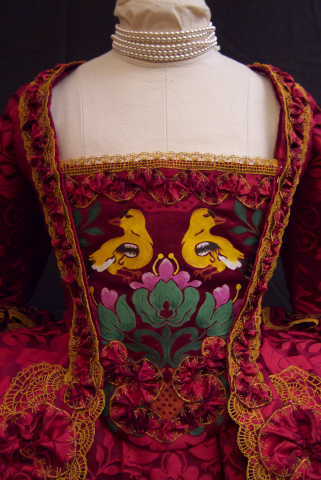 Whether there ever existed a painted stomacher, and the whole gown was not also made from painted silk, I don't know, and haven't made any effort to find out. 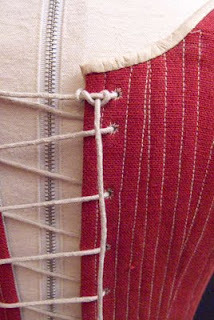 Here you can also see pattern cheat #2: the pattern calls for a set of ties along center back, so that you can expand or contract the bodice. I wanted to 1) not deal with ties and boning; 2) save time; and 3) my torso dimensions don't fluctuate much, which makes this a "nice to have." So, I just put in a big fat dart, and if I do really need to adjust I can let the dart out. 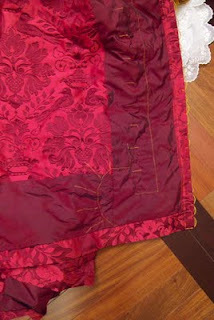 Here you can also see the gold thread that keeps the lace attached. I like facings, because they provide body in key places. 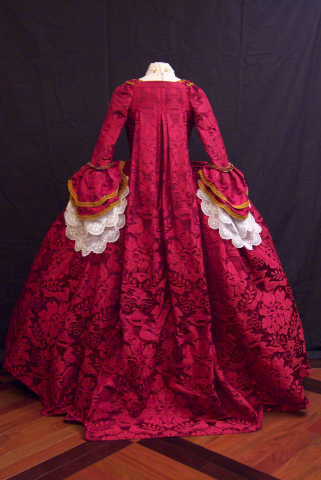 The damask here has a lot of body, but the addition of a facing forces it to behave. Along the hem, the facing also helps defend the fancy fabric from dirt and snags. To make the petticoat I ditched the pattern completely. I took three widths of the fabric (which was somewhat more than enough to go over the under structure), seamed them into a tube, and then pin-fit it to the dress form, pulling up the sides to make the hem level. I tried to make the front very flat, but was having trouble getting the fabric to behave, so ended up with a wide box pleat at center front. 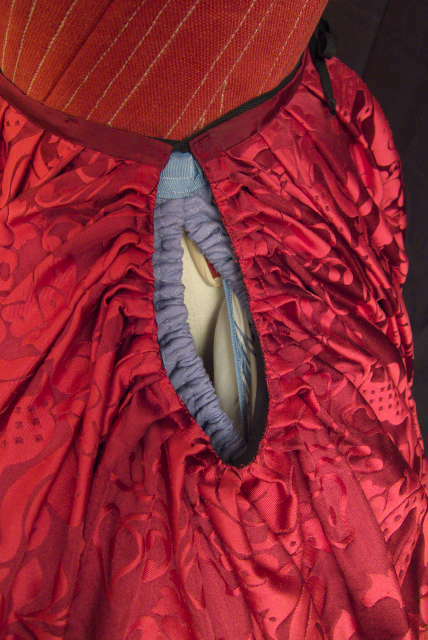 The flounces along the hem go pretty far around because I anticipate wearing the gown "retroussée dans les poches" (meaning with the skirt pulled through the pocket slits) so that I can get the train mostly off the ground. 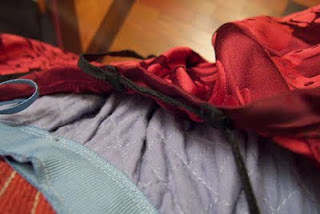 The sides I pleated to a strip of grosgrain, leaving an opening so that I can get to my pockets. 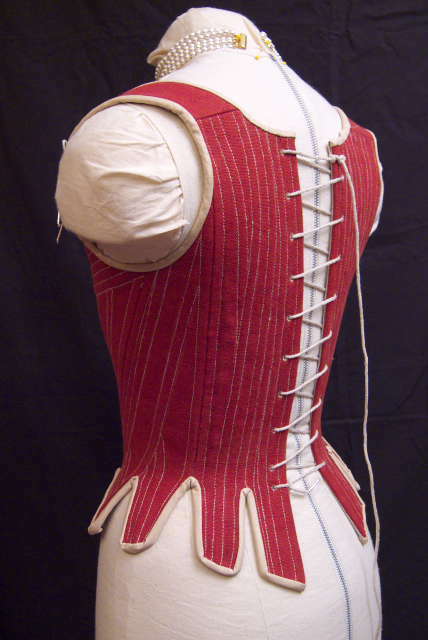 This method is more-or-less suggested by Jean Hunnisett in Period Costume for Stage and Screen: 1500-1800. 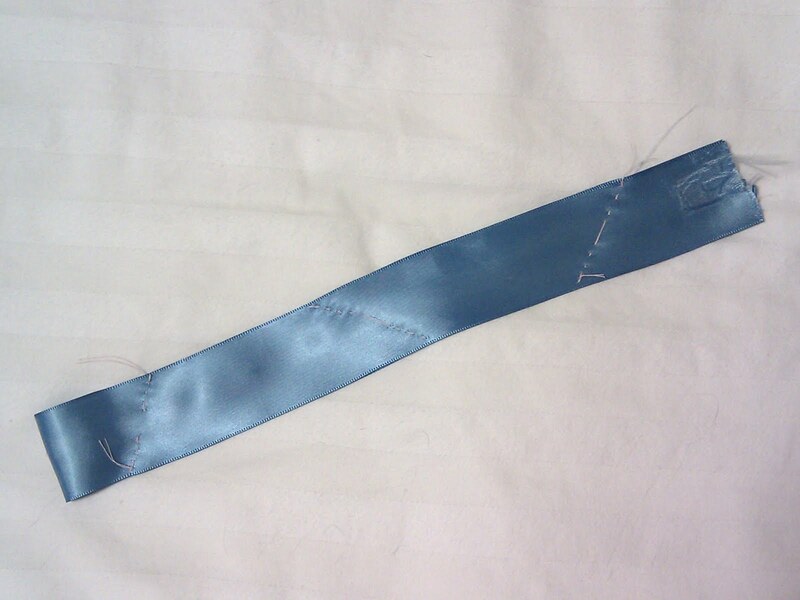 I put a couple of loops on the inside of the front waistband that I thread the ties through. 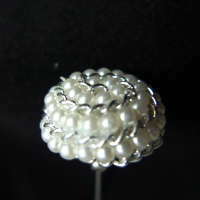 On the back, the loops should have been on the outside, but I muffed up and put them on the inside. They're still usable, but a bit more of a hassle. 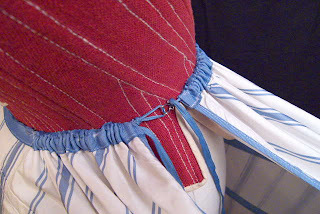 The petticoat's hem facing is just based on, and the ruching is held on with pins. Yeah, big mess. The prominent trim on this gown is the gold lace. As before, I've got higher res photos (and many more of them) on my website. Stop by here. 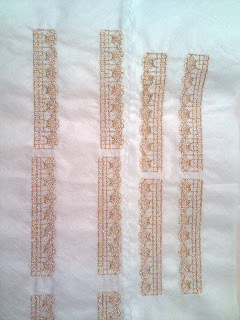 I made this lace using the embroidery attachment on my sewing machine. 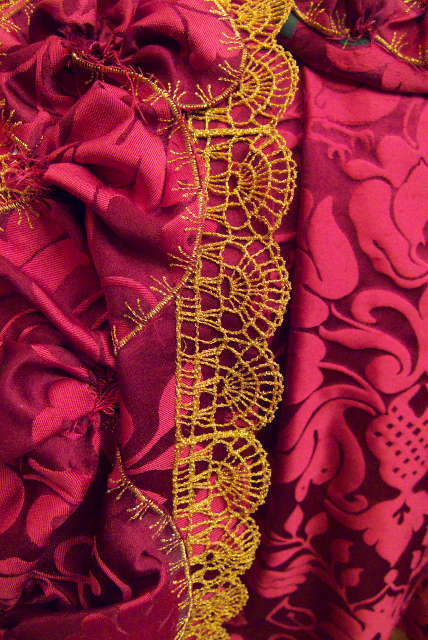 In machine embroidery parlance, this is called "freestanding lace," because it is embroidery that is not fixed to a fabric (hence, freestanding). For thread I used Madeira FS Supertwist Gold 7. 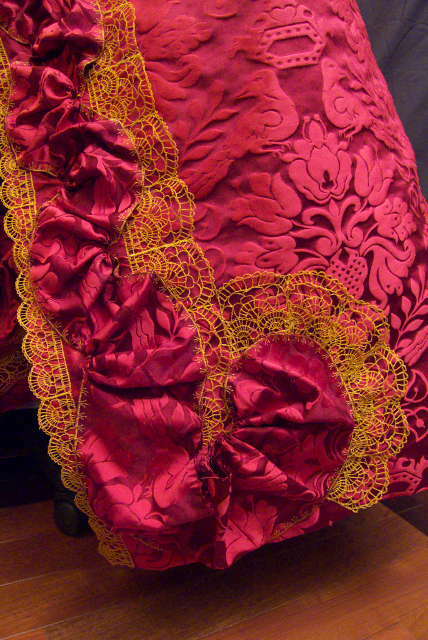 I used 50 weight because I wanted a fine, lightweight lace, but I started running short, so switched to 40 for the top and 50 for the bobbin.This heavier lace only made it onto the front of the petticoat and the very last repeat in the curving section you see above. 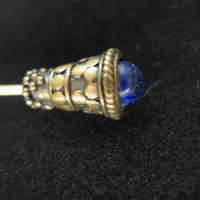 I must say, that the Madeira Supertwist was FANTASTIC. 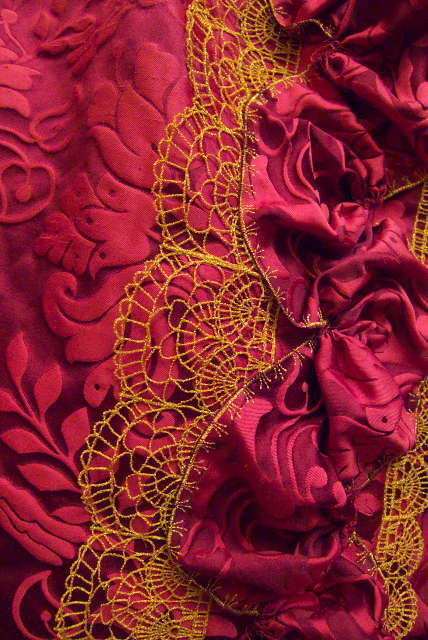 Through hours and hours (and hours) of stitching, it suffered very little breakage.As a freestanding lace it's a little stiff, but looks great. 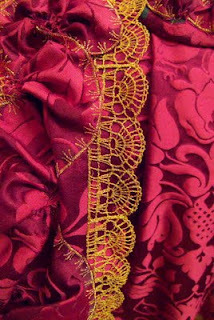 Small lace along the top of the stomacher. 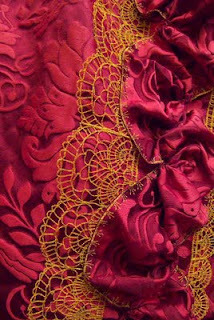 Medium lace along the open edge of the skirt. 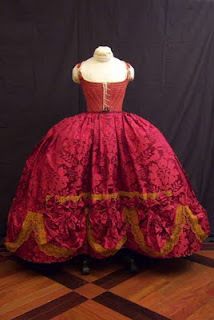 Large lace along the skirt ruching. 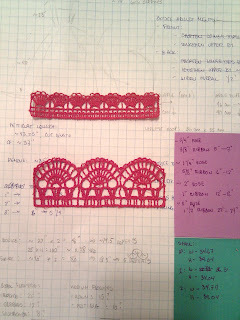 The small and medium lace were digitized by Dainty Stitches, who I found at Secrets of Embroidery. 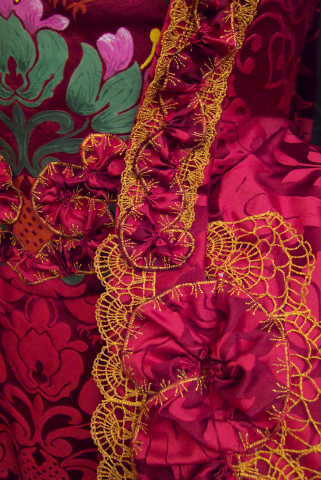 To make the large lace, I took the medium lace pattern and added more scallops. before they hit the water for soaking. Pinning segments onto the sleeve flounces. 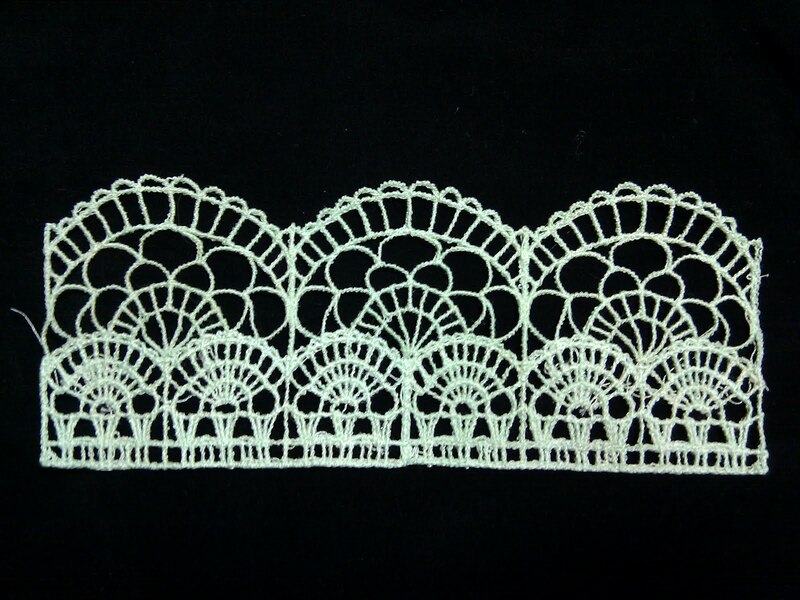 Now, there is a problem with this lace: it's in the style of crochet lace. 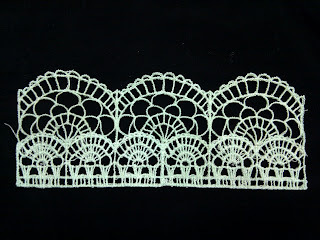 Crochet lace wasn't developed until the 19th century. 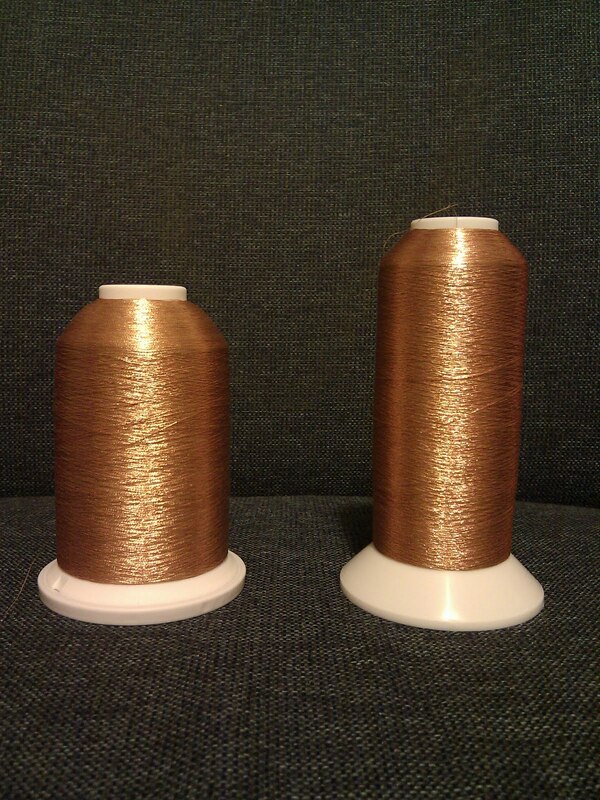 These are 5000 meter (5500 yard) spools. 40 weight on the left, 50 weight on the right. After. Still have a lot of the 40, but the 50 is toast. 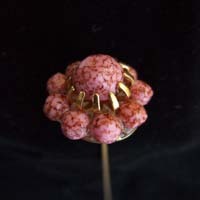 Click this finely crafted link to the gallery on my website. French gown, or robe à la française, or sack/saque gown, with stomacher and petticoat. I've attached the date 1750 to it because it lacks a waist seam, and because of the size of the pannier it goes over. It's meant to be suitable for being seen at court, say, in France (arguably the most "high maintenance" court at this time). 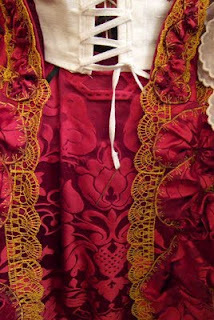 Pattern: for the gown I started with JP Ryan's pattern, and redraped the front to fit me, modified the back pleats to work with the pattern in the fabric, and extended the sides to fit over the pannier. 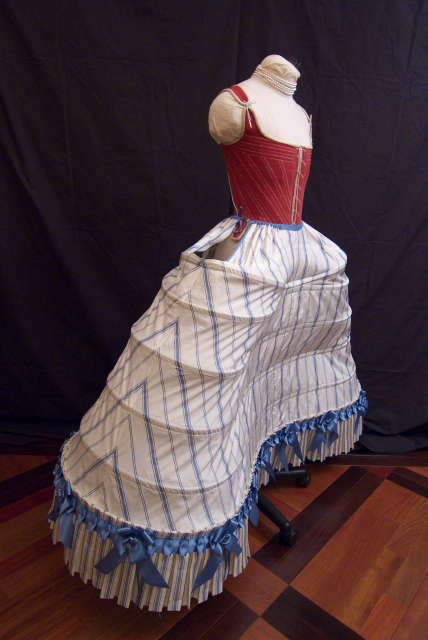 The petticoat I draped and pleated into shape. Fabric: Scalamandre "Love Birds" silk damask. I believe the color is "Georgian Red." 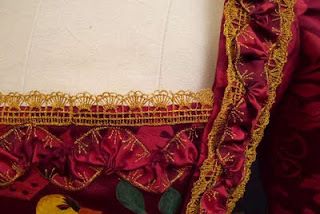 Trims: self fabric ruching, edged with a fancy machine stitch, in imitation of hand embroidery. Gold machine-made lace, in the style of crochet lace. 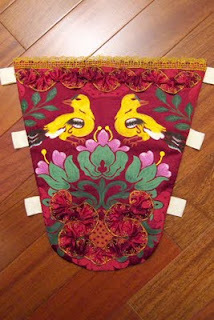 Stomacher: painted silk and self fabric ruching. More photos, of course! 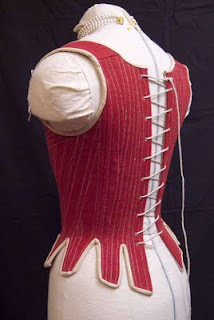 I'll start taking the gown apart (visually, that is), and describing each element. 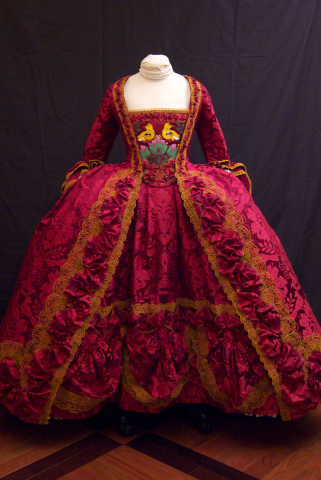 These photos also capture the gown as it looked on its first wearing. I'm calling this the first incarnation because, first, I didn't finish all the trims I had planned, and second, at this point I see things I want to change. More on both, soon. 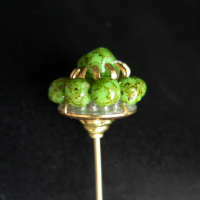 Pearl Cluster Hat Pin 12"
Pearl Spiral Hat Pin 12"
Green Rocks Hat Pin 10"
Pin Rocks Hat Pin 9" and 10"
I've also added galleries for these, and a few others that are not for sale, to my website.